The seasons are changing and you have noticed these flying insects invading your home again. What does this mean? Termites are swarming! Termites live in colonies typically inside the wood of your home. When the climate is of optimal conditions and the current colony reaches a certain size, termites are ready to venture off and start a new colony. Termites like the hot weather and are attracted to light. This is why you see the little critters flying around when the suns out near your windows and light fixtures. For most people, when this happens it’s the first time you realize that your home is being invaded. It’s important to act fast and call in a professional to help keep your home safe. Termites literally eat through the wood structure of your home compromising what you value. Licensed professionals are able to inspect, identify and eradicate termites. It’s mating season! Termites leave their colonies to find a mate and eventually start a new colony. Generally colonies are signaled by prime weather conditions to coordinate the release of their reproductives. Once the winds are calm and it’s overcast out, it’s go time. Wet soil aids in nest building and humidity them survive too. They don’t always swarm outside, on occasion a colony can misjudge and release thousands of flying termites inside. Even when they swarm strictly inside the new colonies will still develop successfully. An average colony swarms when they reach their optimal size which is determined by the number of workers in the colony. 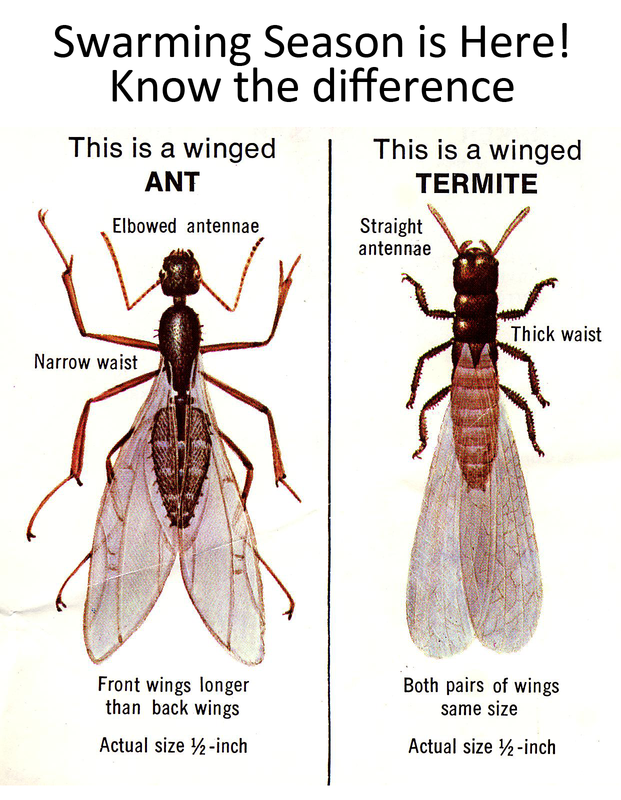 Typically this happen at least once a year but the number of winged termites can vary. This swarming process happens over a period of a few days. Normally beginning with once large swarm and progressively releasing less termites in two different groups. Termites have been reproducing in this way year after year for centuries!